What a gift for the Golfer in your life. 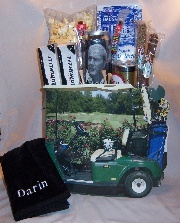 This basket is full of delicious snacks and useful golf items. One bag of popcorn, a bag of cookies, a can of Arnold Palmer tea, nuts, chocolate, beef jerky, golf balls and a personlized golf towel.